One of the benefits to being paid to fly around the country is the office view. Not only is it visually spectacular, it offers an insight on our world that not many people get to see. And we get to see it in every different kind of lighting and weather. Even the weather itself makes for some spectacular scenery. Anyone who has lived near a large body of water can appreciate how the same vista can look completely different day after day. The view from the cockpit is a little like that. 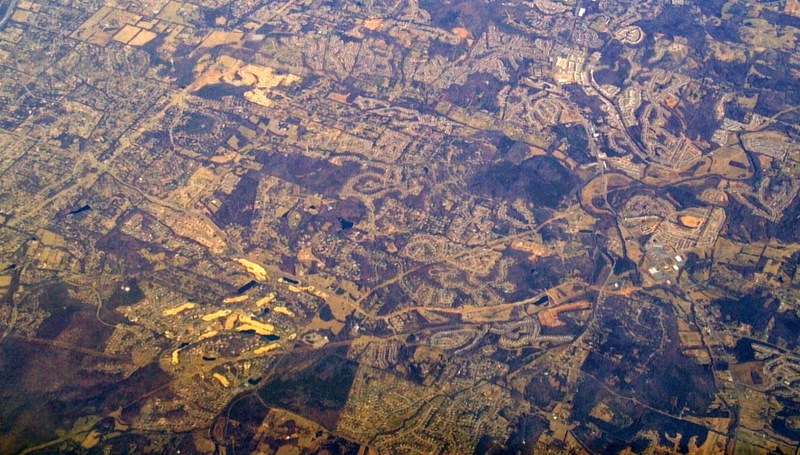 Looking down at the ground reveals features both natural and man-made which are mostly hidden from the view of those who live their lives in offices or homes. Even those who drive the nations' highways get only a limited view of a mile perhaps on either side of the road. No, I wouldn't trade my corner office view with just about anyone. As we fly along, many features are instantly recognizable but quite a few more are not. Some may be familiar but present themselves quite differently when seen from above. And there are some objects, patterns or buildings that are just inexplicable. For example, a few dozen miles east of El Paso there are grids of lines carved into the desert for no apparent reason. One can speculate that they might at one time have been a planned community which was never built but its only a guess. 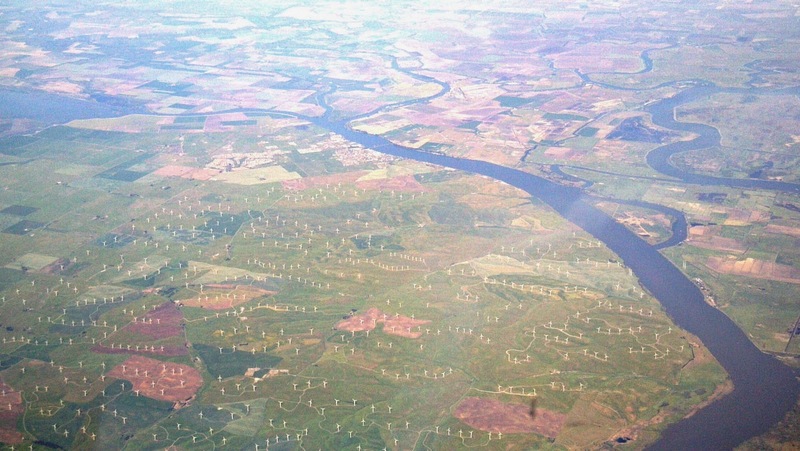 Numerous other features which sit in the middle of nowhere or seem improbable can be seen from the air. Some things seen are military in nature and some are related to agriculture. 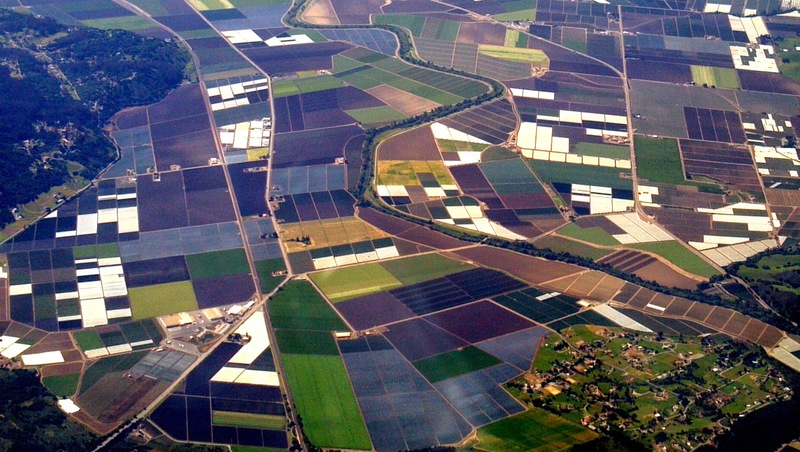 Different styles of agriculture are easily visible from the air. On flat land, there will be straight crop lines or crop circles. On hilly land such as this, terracing is apparent. The snow sets off the terrace lines nicely. 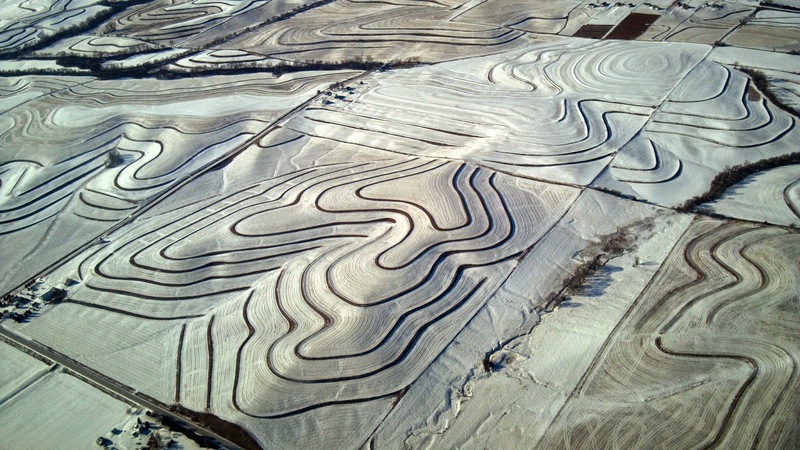 This photo was taken just east of Omaha. Here are some fields near Salinas, California. Different crops appear as different colors though I have no idea what is being grown. Plastic covered fields for strawberries to keep weeds down appear light in color. Power plants are always interesting features. In America today, very little old line "smoke stack" industries are left such as ore smelters, so when smoke stacks or cooling towers are seen, they are most likely power plants. Some have ponds instead of stacks as well. 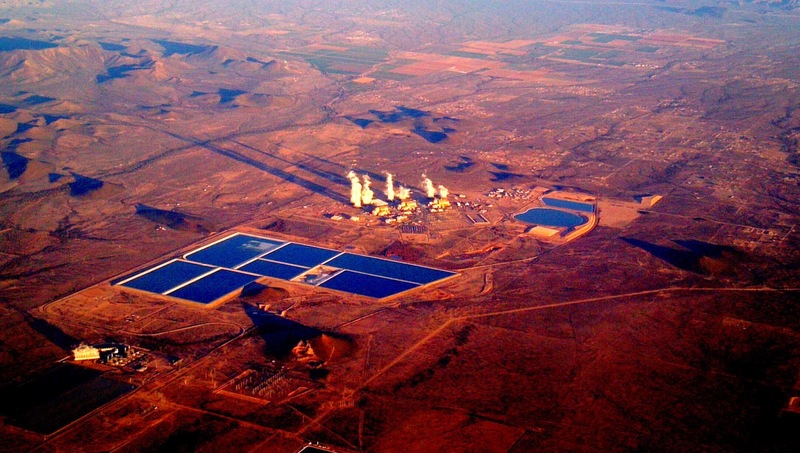 Here is a shot of the Palo Verde Nuclear Generating Station just west of Phoenix. There are three units here each apparently in operation as evidenced by the steam plumes emanating from the cooling towers. Also visible are some gas fired peaker plants used to supplement the grid at high demand times and a number of cooling ponds. Visible here on the left is a coal powered plant made obvious by the large pile of coal. 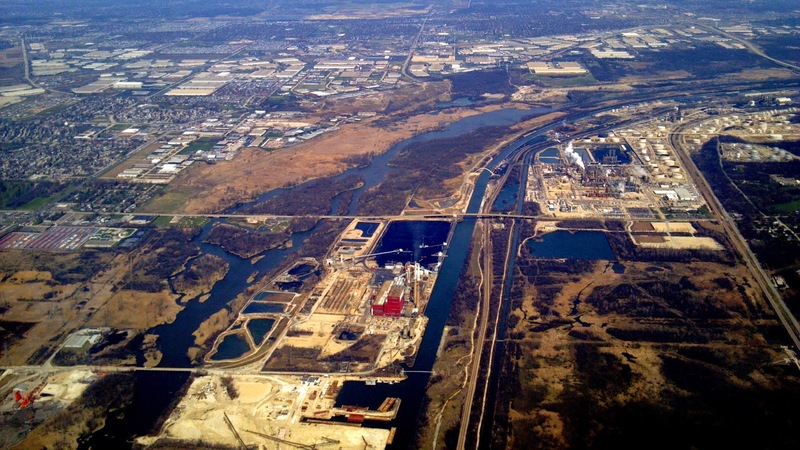 On the right is a refinery. These are both on the Chicago River just southwest of downtown. 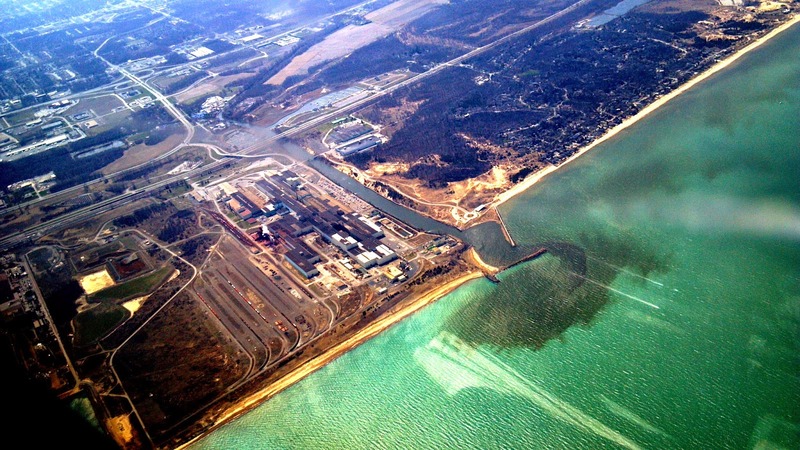 Here is another industrial area on Lake Michigan. What they might do here I have no idea but the dark water flowing into the lake is more likely silt than anything else. 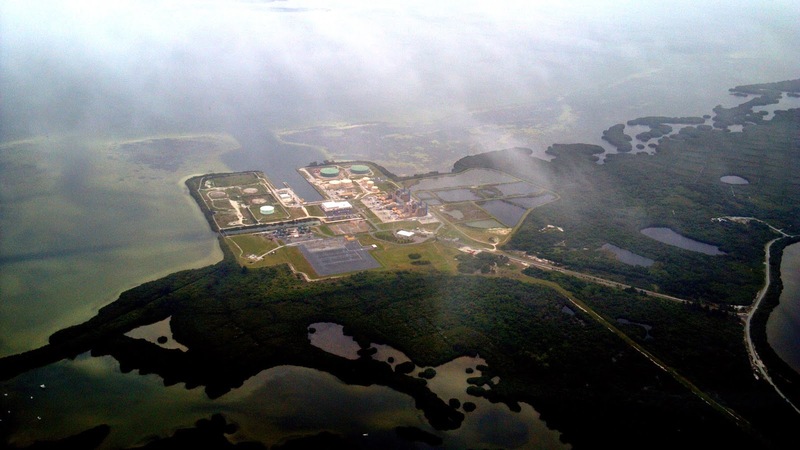 This plant located near Tampa looks to be fuel oil powered. Notice the lack of smoke stacks or cooling towers. Cleverly hidden in this photo is California's Diablo Canyon Nuclear Generating Station. The last of California's operational nuclear fleet, this station is behind the bluff in the center of the photo nestled between Pismo Beach and Morrow Rock on the ocean. Unfortunately visitors are not allowed at the plant but there is a very informative visitors' center in nearby San Luis Obispo. 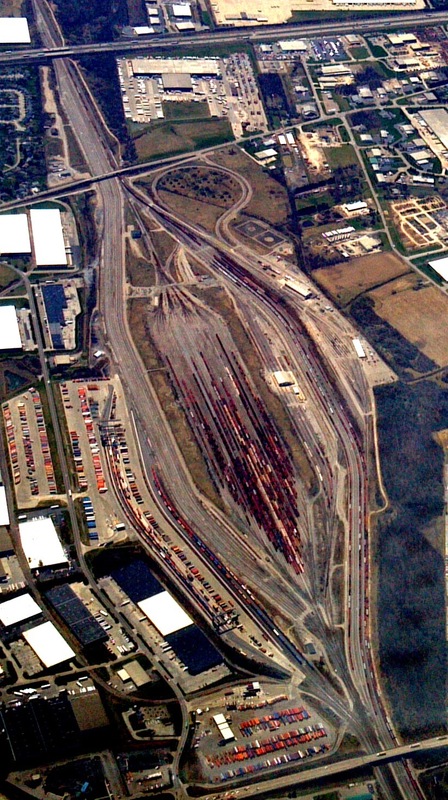 This is a train yard in Columbus, Ohio. 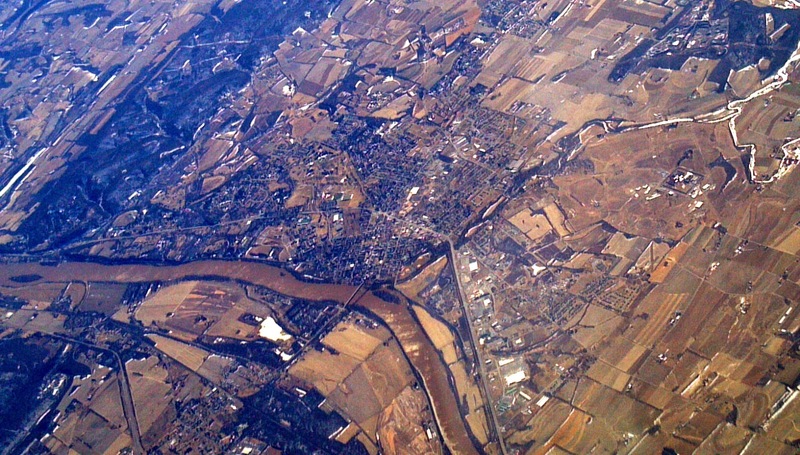 From the air, train tracks can be difficult to tell apart from highways. One must look for clues such as intersections, bridges and ramps to be sure. This windmill farm is located in the Montezuma Hills in the Sacramento River Delta. A favorite spot with windsurfers, the wind is quite strong here as the Sacramento and San Joaquin rivers cut through California's coastal range providing a pressure relief valve between moist cool air coming off the Pacific and the warmer dry air in the central valley. One of the sites of California's original wind farms built in the '70s, the current windmills dwarf the original models and were only recently installed. 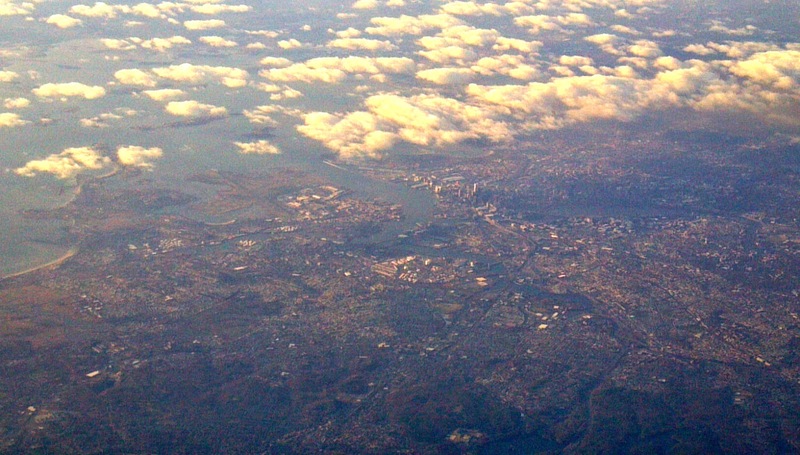 Large cities are always impressive from the air. Trying to imagine all the people in one place can be overwhelming. 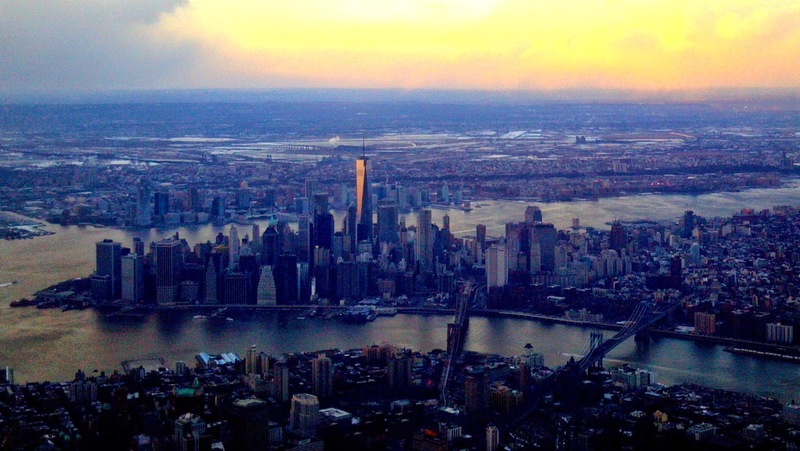 These two shots are of the Big Apple from over Brooklyn looking to the northwest. 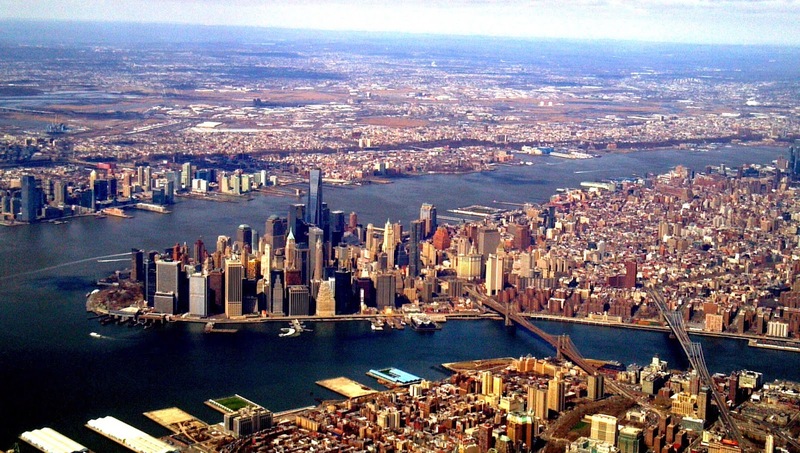 The new World Trade Center is clearly visible as is the Brooklyn Bridge, East River and New Jersey in the distance. It doesn't look so big from the air but try getting across town at rush hour. 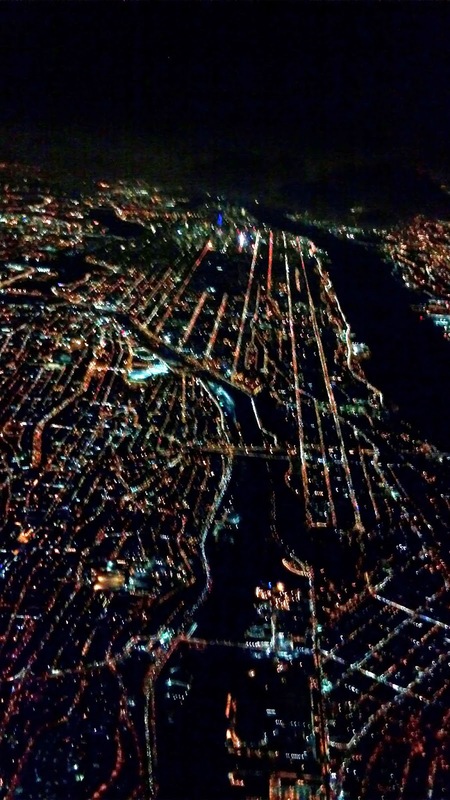 On the right is a night picture of Manhattan looking due south. 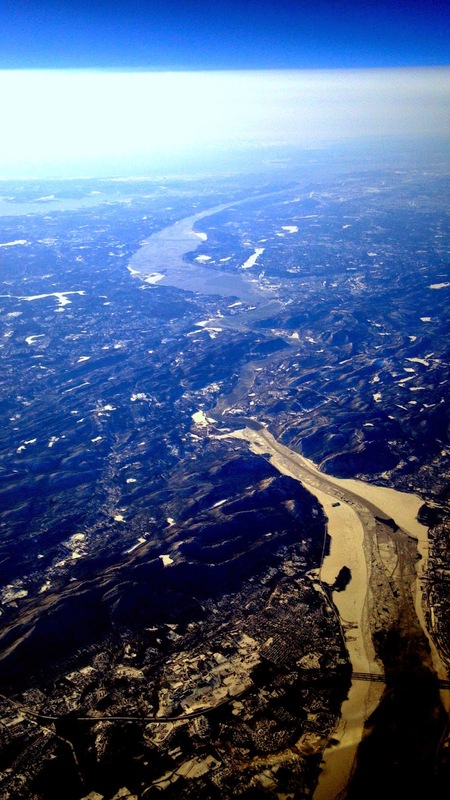 The Harlem river is visible in the foreground. Picking things out at night takes a bit of practice as many things look completely different in daylight. By the way, this is about where Sully was when Canadian geese took out his engines forcing a landing in the Hudson seen on the right of the photo. 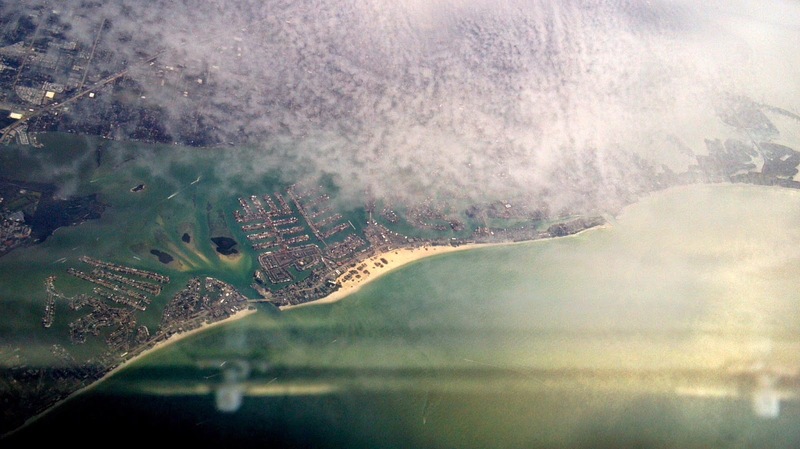 This a picture of Bean Town (Boston) from perhaps 40,000 ft looking to the southeast. Chicago (my kind of town) is quite striking on a clear day. The ice only left the area several weeks and most Chicagoans are probably hoping that Spring falls on a weekend this year. 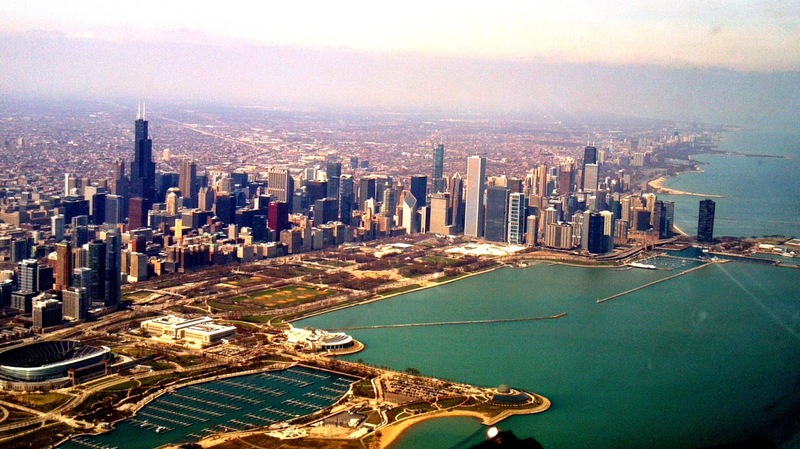 Chicago has GOT to be one rockin' town because no one is moving here for the weather. Soldier Field is visible in the lower left hand part of the shot. 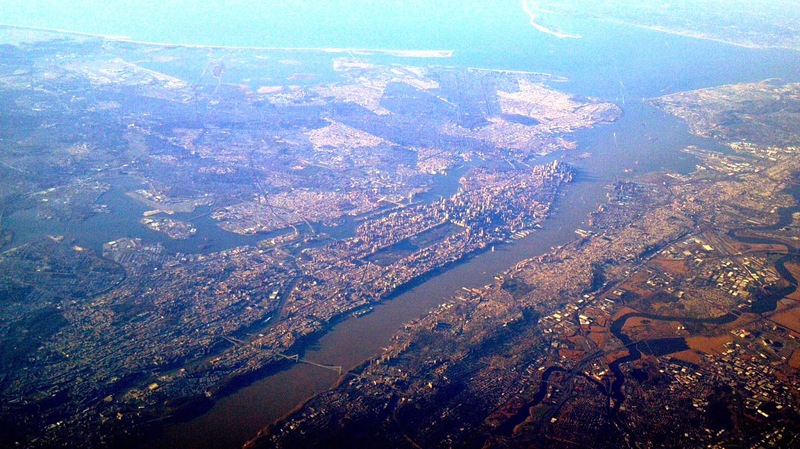 Here's a shot of the greater New York City area from the north. The Hudson River, Central Park, George Washington Bridge (Chris Christie call your office, please), Staten Island, and even Sandy Hook, NJ in the distance are visible. We occasionally get to fly over the places that we're supposed to land. This might be because we're coming from the west and landing to the east which means flying past the airport and turning around. 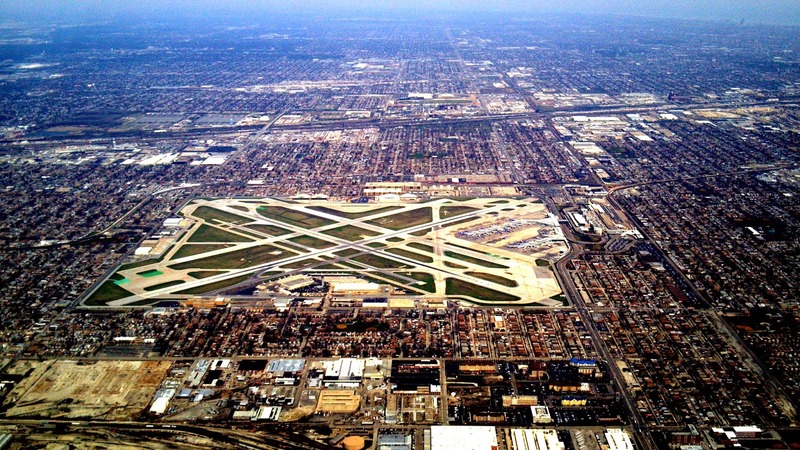 Above is Chicago's Midway with O'Hare below to the right. 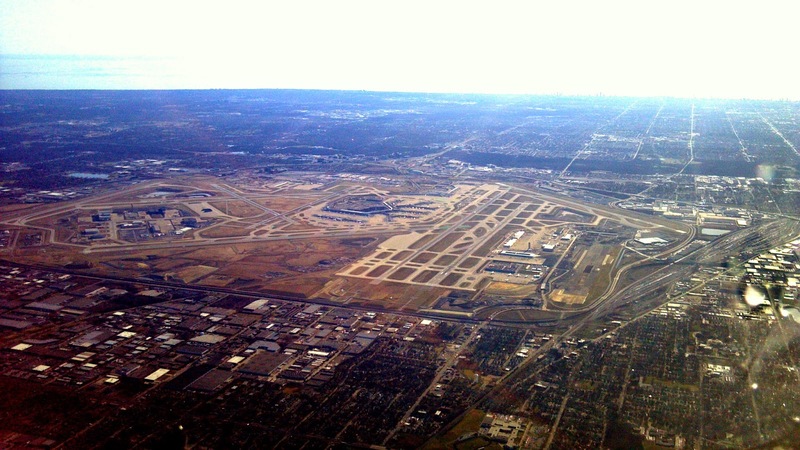 This is a shot of Tampa International from the south looking north. The folks living under this approach have managed to get the western runway designated as primary to keep the noise down. It was closed today. 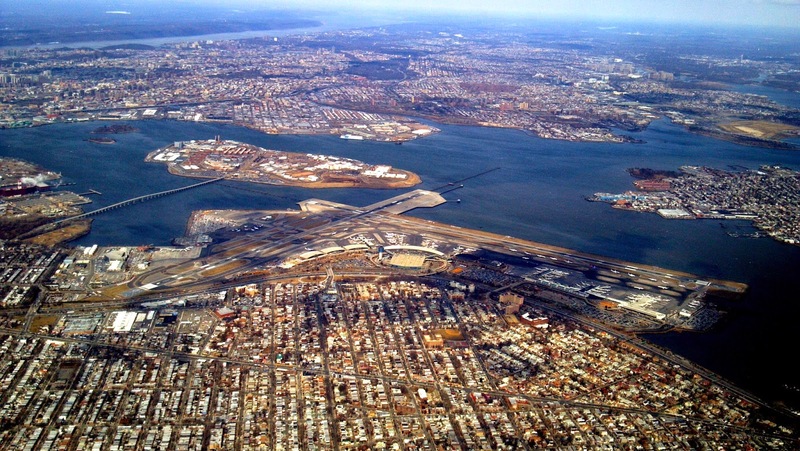 La Guardia airport, named after Mayor Fiorello La Guardia opened in 1939 and hasn't been improved since. With short runways, restricted airspace, and limited ramp space, this airport is a challenge to fly into and suffers congestion and delays. It's also where Sully's ill fated flight originated. 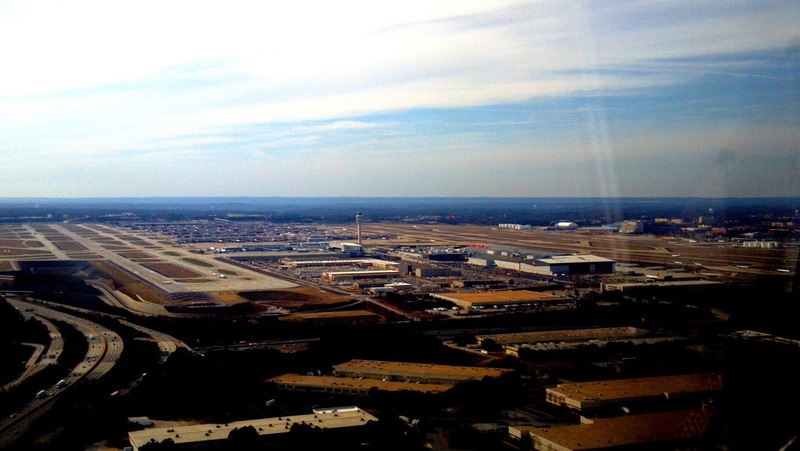 To the left is Atlanta's Hartsfield-Jackson airport. One of the busiest in the world, there are more than the usual amount of "local" rules in effect. It's important to keep up with complex taxi instructions in this maze. Some views from the airplane are just cool. Here are a few of my faves: This is a view of the Hudson river looking south from just north of West Point. The school is on the right side of the river at the bend. You can see a fair amount of ice on the river posing navigation problems for river traffic. 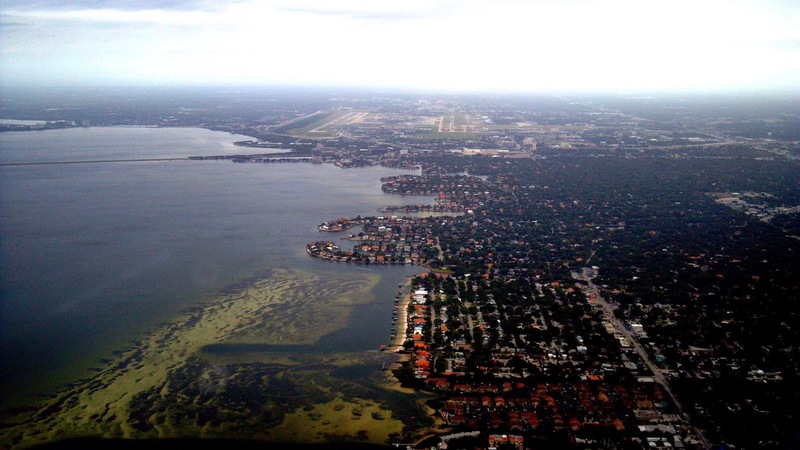 This is a view of Treasure Island which is just to the west of St Petersburg, Fla. It also happens to be the site of where we spent Spring break at the Bilmar hotel. The beach was delightful! 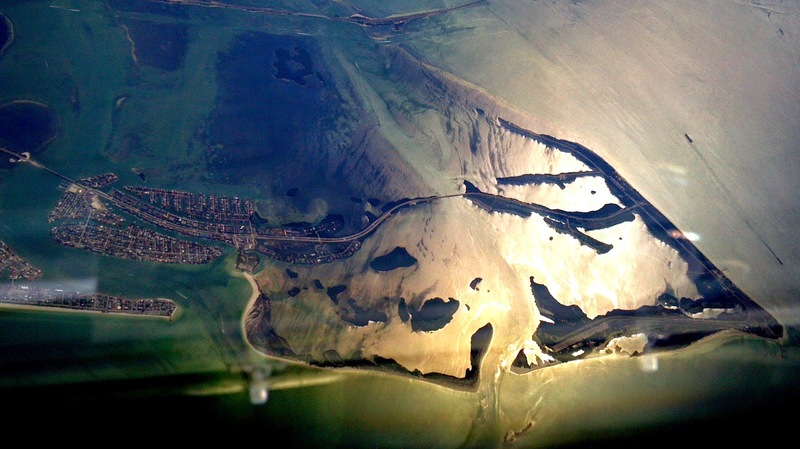 Just to the south of Treasure Island are some more barrier style islands. Often you can see details in the surface of the water from many miles up. This is a view of Philadelphia from South Jersey looking north across the Delaware river. 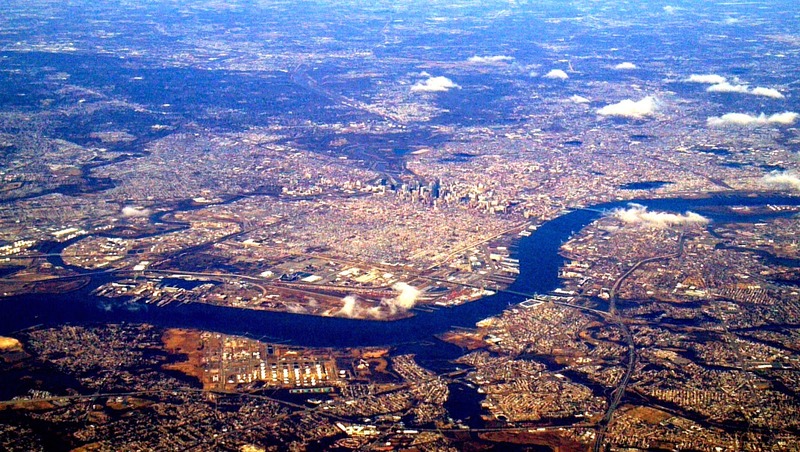 Philly Intl Airport is off the left side with the sports complex in South Philly clearly visible. The SS United States is still berthed on the Delaware awaiting refurbishment into a museum. It's docked on the Pa side north of the Walt Whitman Bridge. 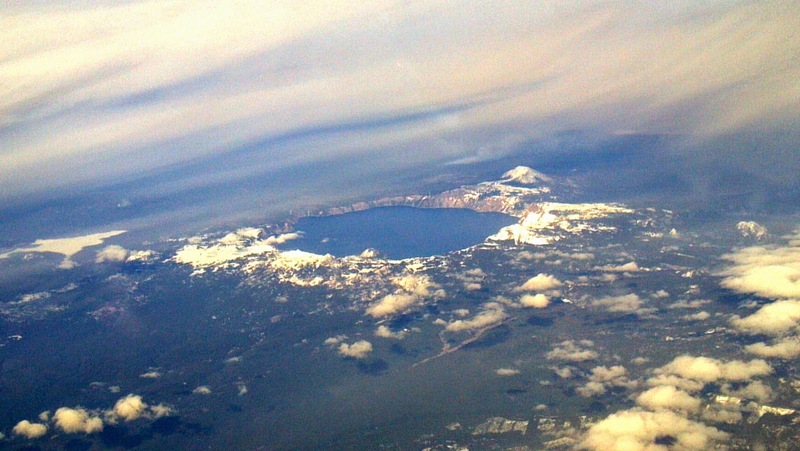 Here's a very popular site to point out to the peeps in back: Crater Lake. The remnants of a tremendous volcanic explosion, the lake is one of the deepest in North America. 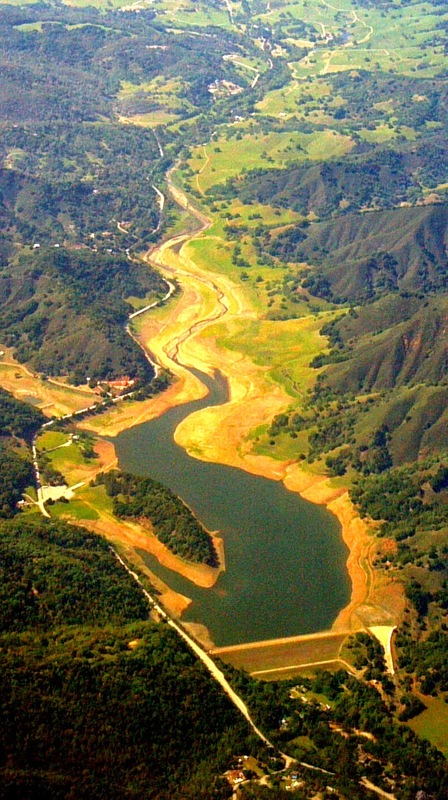 Drought ravaged California can't seem to catch a break, not that they deserve one. Here's a reservoir south of San Jose which looks more than half empty. And this is at the end of the rainy season so it will be a long summer. 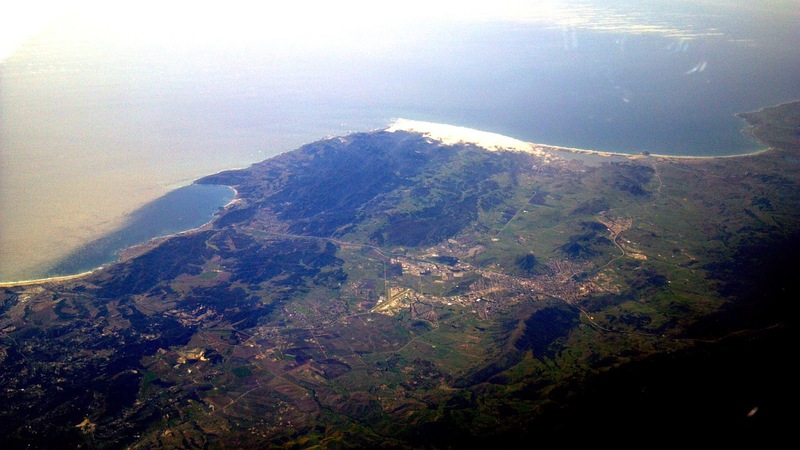 Cali has two colors from the air: green during the rainy winter, and brown in summer. With so little rain, Cali was still very brown when I flew over in January. It normally goes green in November. It's green in this shot but the grasses will soon turn their summertime brown. Historically, California was covered in perennial grasses but non-native annual grasses brought by Spanish settlers in the 1700s quickly displaced the more drought tolerant native species. Today, California is 99% covered with annual grasses from the Mediterranean. 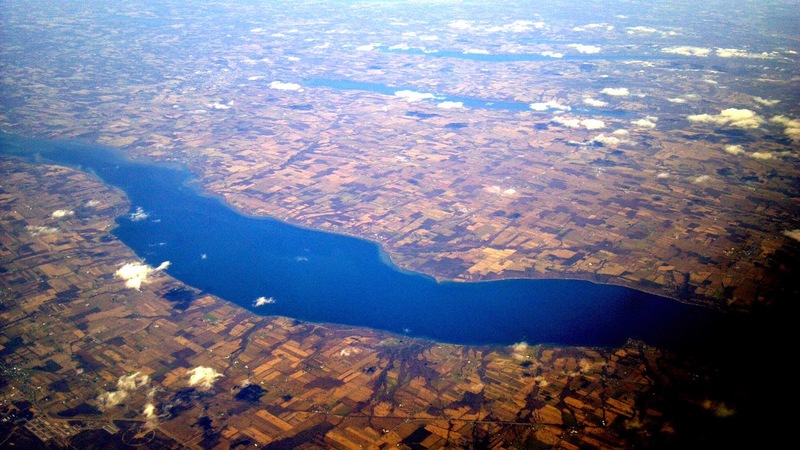 On the other side of the continental divide, the Finger lakes in upstate New York seem to be doing well, water-wise. The Finger lakes were carved by glaciers in the Pleistocene era and yes, I looked that up on Wikipedia. Here in the Sawtooth mountains of Idaho we can see where wild fires stripped the trees. Here the snow is clearly seen instead of the usual conifers. Forest fires are a routine site when flying out west. Aircrews help authorities by reporting smoke when flying over. 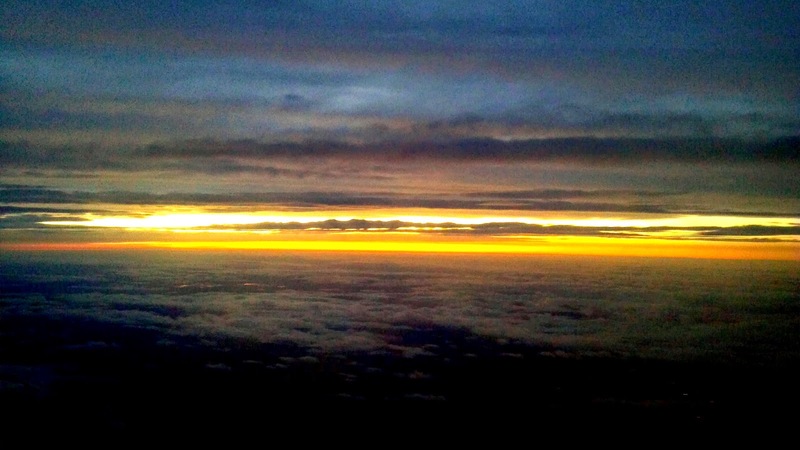 Except for storms, pilots normally don't fear clouds. They might roughen up the ride a little bit or throw a bit of ice on the wind screen but otherwise are no problem. Except for one especially deadly type of cloud even more deadly than the Cumulo-nimbus (storm cloud). That would be the Cumulo-granite. Yes, the one with a mountain hiding inside. Here's a good example. That's Mt Adams in Washington state. 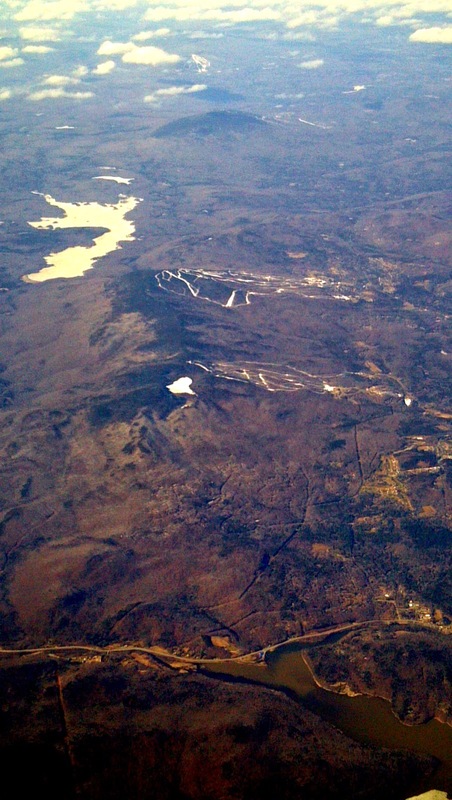 This is what a ski resort looks like from altitude in late Spring. The only snow left is that on the trails which are groomed with man-made snow. This one is in New Hampshire west of Concord. The lake on the left still appears to be frozen while the one in the foreground is not. It can seem unusual to appear like this until you realize that the frozen one may be at a much higher altitude than the thawed one. 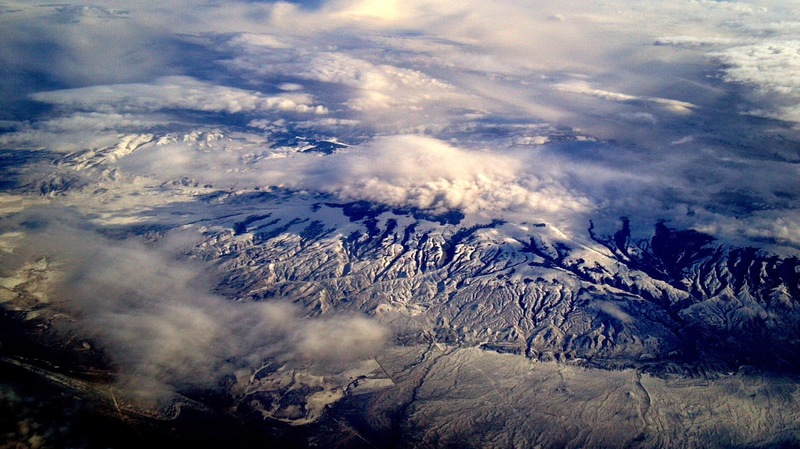 There are just some very cool looking mountain features out west, especially when the snow brings out the contrast. Here's a view from somewhere in southern Montana. 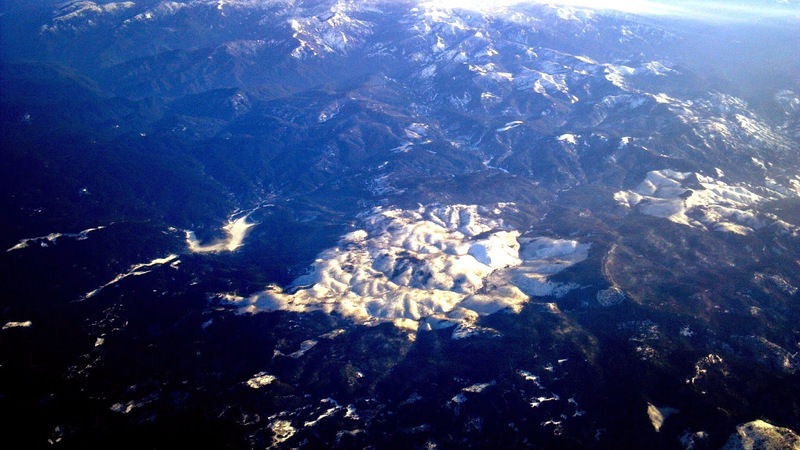 Some things seen from the airplane just don't seem to make much sense. It might be a building, pattern on the ground or some other unknown item. Perhaps some of these things are remnants of long abandoned construction or military projects. Rumor has it that some markings out in the California desert are those left from Patton's 7th Army training to do battle with Rommel in North Africa. 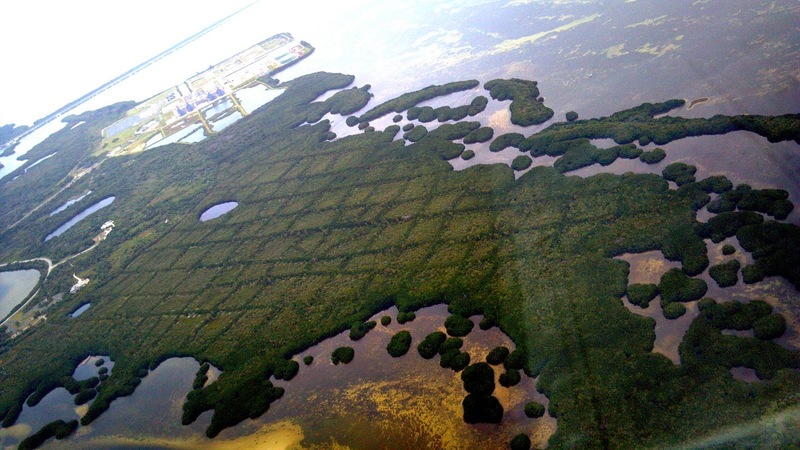 Here is a shot of some swamp marsh bordering Tampa Bay. In it can be seen some sort of grid but what it is and how it got there is anyone's guess. 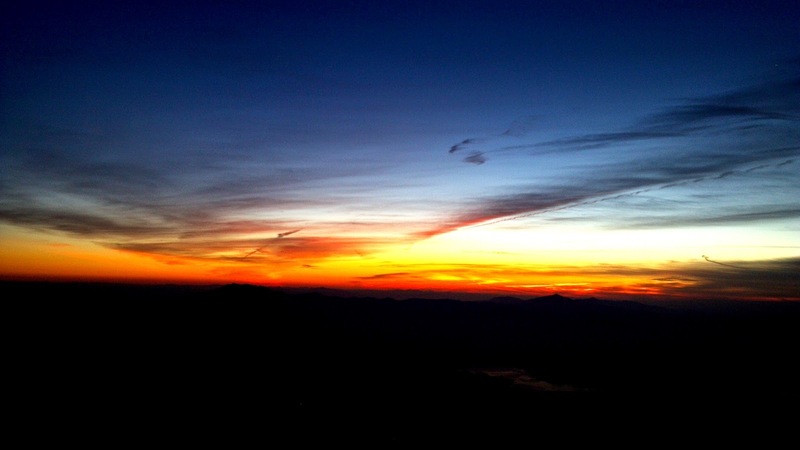 Sunrises and sunsets can be particularly beautiful when seen from altitude. It's even possible to see the "shadow" of the Earth when the sun comes up behind you. 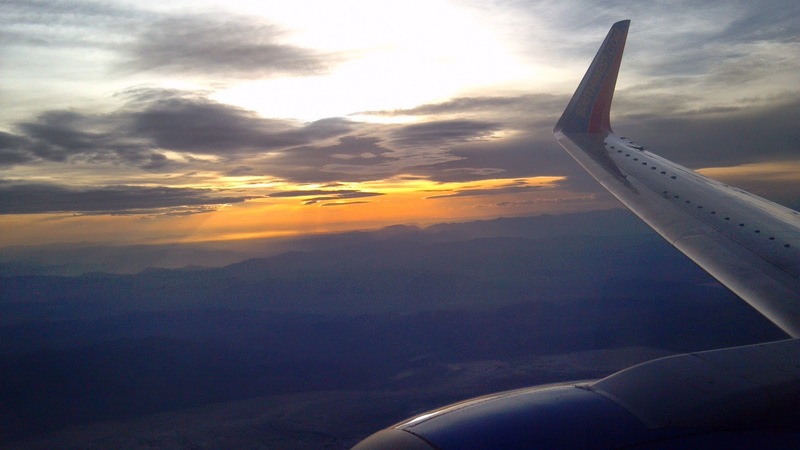 Here's a sunset on descent into Vegas. 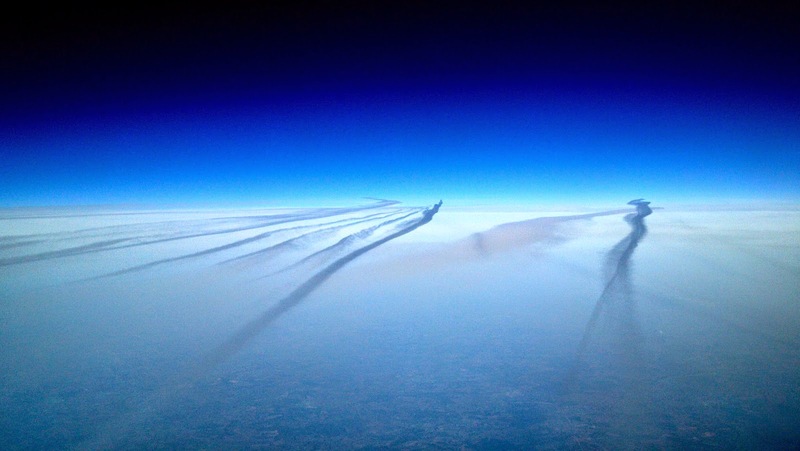 While airliners are capable of navigation independent of ground based aids, some "highways" in the sky still appear to exist. Here's a number of contrails headed from the Northeast towards Florida during Spring Break. These ugly looking red areas are more benign than they might appear. 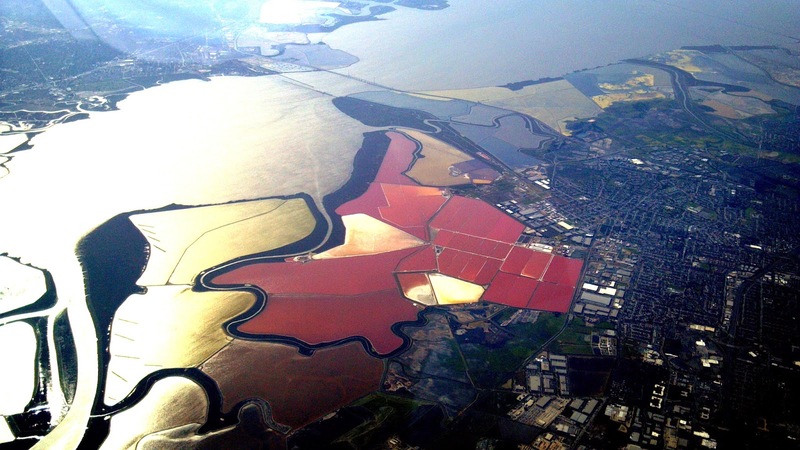 They are salt evaporation ponds formerly owned by Cargill near San Fran. The ponds were flooded and then allowed to dry leaving the salt. The color comes from algae which likes the salinity. The intensity of the color varies with salinity. The ponds were acquired by conservation groups in 2003 and are being restored to wetlands. This winter has seen an abnormal amount of ice due to global warming climate change. 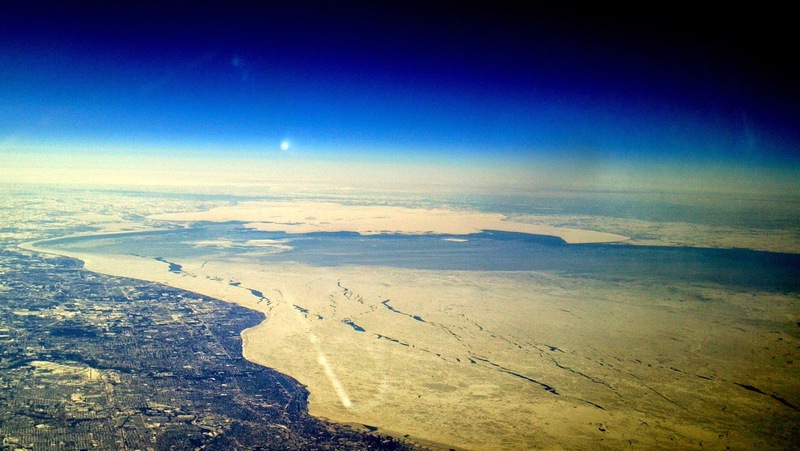 This shot is over Lake Erie looking west. Cleveland is on the left bank of the lake. Flying over places where you've spent time is always cool. You get to look for places you've spent years living only to discover they look nothing like you imagined from altitude. This is a picture of Tennessee where I currently reside. The lighter looking peanut shaped areas in the lower left of the photo are the dormant greens of the Governor's Club. Dolly Parton's house is in the picture. Tracks that look like highways across the lower part of the picture are actually powerline and gas pipeline right of ways. This is a shot of Lewisburg, Pa, home of Bucknell University. In spite of my best efforts, I did leave here with an engineering degree. Joining the military did however spare me from having to remember anything I might have learned there (in class). This is where I grew up outside of Philadelphia. 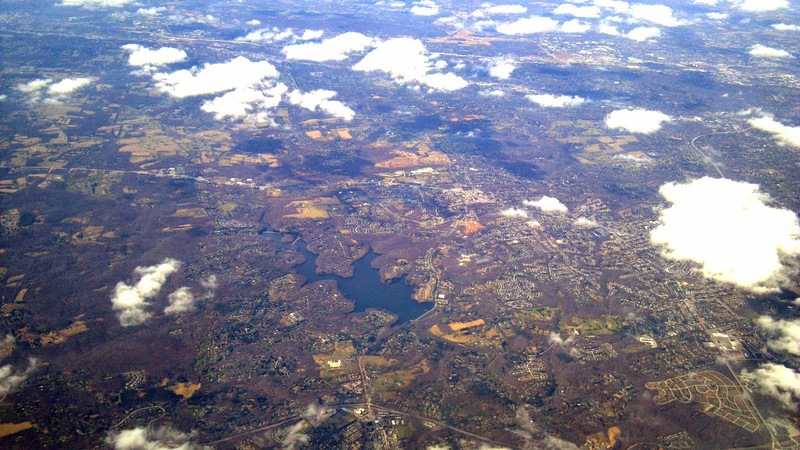 The Springton reservoir in the photo is just south of my hometown of Newtown Square. Here's a neat shot of the Sangre de Christo mountains south of Colorado Springs. 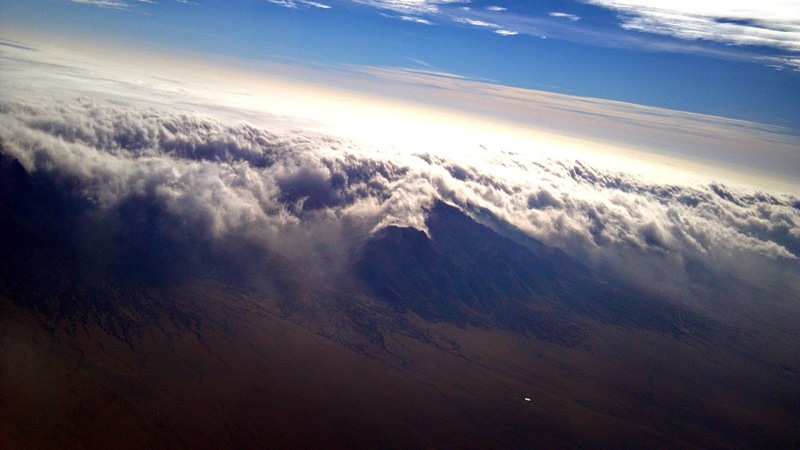 Above them is a long cloud called a lenticular cloud formed by wind currents forced up over the mountains. 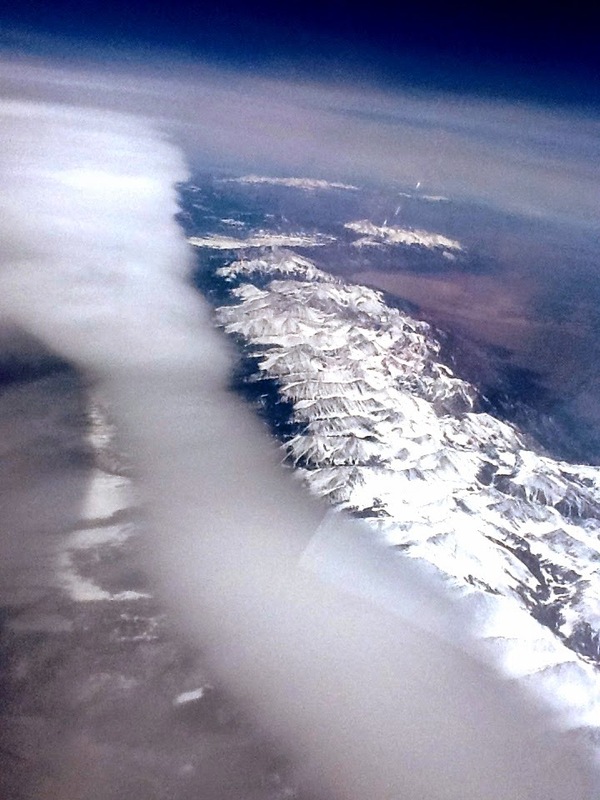 Seeing this type of cloud at high altitude alerts pilots to a phenomenon known as mountain wave. Sort of like surfing a wave, caution must be used as mountain wave can cause the airplane to exceed its maximum mach. 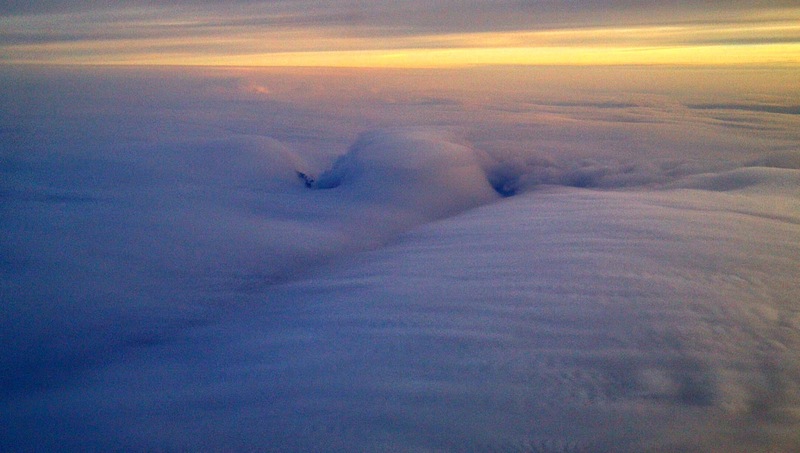 Here's another shot of clouds being held up by mountains. As the moist air traverses the mountains it gives up its moisture and leaves only dry air downwind. These next few shots are of various sun rises and sunsets I've been fortunate enough to capture. When asked what its like to be a pilot...I always answer: beats working for a living. I hope you've enjoyed this little photo montage of a few weeks in my office. They were all taken with my phone camera while I was deadheading in back of the aircraft though I did take the liberty to add some contrast to a few of them.